Supplement Like You Mean It. Supplement your horse at the cellular level and watch the magic happen. Equine Omega Complete is our everyday product for every horse. It is a specifically formulated blend of mechanically expelled (not chemically extracted) organic soybean oil, human grade, deep water, wild caught fish oil and 1,200 IU’s of all-natural vitamin E per daily dose. This product has NO chemical processing, NO hydrogenated fats, is comprised of all human grade ingredients with a very balanced ratio of Omega 3’s to Omega 6’s. Equine Omega Complete - A Complete Essential Fatty Acid (Omega) Supplement. All Natural. No Chemical Processing. No Hydrogenated Fats. 85% Organic. Eight USA & International Patents and Thirteen Patents Pending One gallon is a one month's supply for one horse. $69.95 per gallon. Volume pricing on 4 gallons or more. Good fats and calm calories that will not make your horse hot! Every horse needs them and Equine Mega Gain’s combination of omega-3’s, 6’s and 9’s are beneficial to any horse’s diet. Equine Mega Gain contains no processed fats. We use organic, mechanically expelled (cold pressed), non-GMO soybean oil. The addition of calm calories may also help support: athletic performance, reproductive health, moody heat cycles, milk production and body and coat condition. We suggest you feed one gallon of Equine Mega Gain over a period of one month (4 ounces daily), or until your horse reaches the desired condition. Then transfer your horse onto Equine Omega Complete, also fed at 4 ounces daily, for additional benefits such as joint support. One gallon is a one month's supply for one horse. $57.95 per gallon. Volume pricing on 4 gallons or more. Equine Mega Sweat - A Specifically Concentrated Version of Equine Omega Complete. It may help treat Anhidrosis, a disorder that prevents sweating in some horses. Utilizing Equine Mega Sweat, most horses start sweating within 24-48 hours. Horses with Anhidrosis are slow to recover after exercise. Symptoms may include: panting heavily, very little or no sweat, elevated pulse and a higher than normal body temperature, a flaky coat and/or coat loss and distressed or lethargic behavior after exercise or even after work has ceased. It is imperative that owners pay close attention and notice signs of Anhidrosis, as it can be a dangerous health condition. Anhidrosis is most commonly found where temperatures and humidity are high. While the mechanism is known, it is unknown why some horses are more susceptible to developing the condition. We suggest that horses exhibiting symptoms of Anhidrosis receive one gallon of Equine Mega Sweat. You will feed 4 to 5 ounces twice daily before switching to Equine Omega Complete for maintenance. This gallon will last about 2 weeks. You may purchase a combo pack (one gallon of Equine Mega Sweat and one gallon of Equine Omega Complete) in the purchase area. Equine Mega Sweat – Instructions and Helpful Tips Equine Mega Sweat is a specially formulated blend of mechanically expelled soybean oil with added human grade, marine fish oil and all-natural, non-synthetic vitamin E. Top-dress Equine Mega Sweat over a high quality, low-fat, grain. Why a Low Fat Grain? Equine Mega Sweat is nearly 100% crude fat and pairing it with a low-fat, complete grain ensures that the majority of fat in the diet is all-natural and healthy. We suggest a high quality, low fat grain, aim for 6% fat or lower and lowering your use of Alfafa hay. We suggest that horses exhibiting symptoms of Anhidrosis receive one gallon of Equine Mega Sweat. You will feed 4 to 5 ounces or pumps twice daily. This gallon will last you about 2 weeks. We have a typical success rate of 90% of helping horses to begin sweating 24 to 48 hours after beginning the product. If you horse is NOT sweating after 48 hours, we ask that you contact us. Once your horse is sweating normally, keep them on Equine Mega Sweat until you have used up the gallon. After that it is important to transfer and KEEP them on Equine Omega Complete to maintain normal sweating as well as the other benefits that Equine Omega Complete provides. $107.95 per gallon. $153.94 per gallon when purchased with our Oxy Cleanse. Equine Omega Vitamin E is a specific formula to support a variety of equine conditions requiring additional Vitamin E support. Equine Omega Vitamin E is a specific version of Equine Omega Complete. 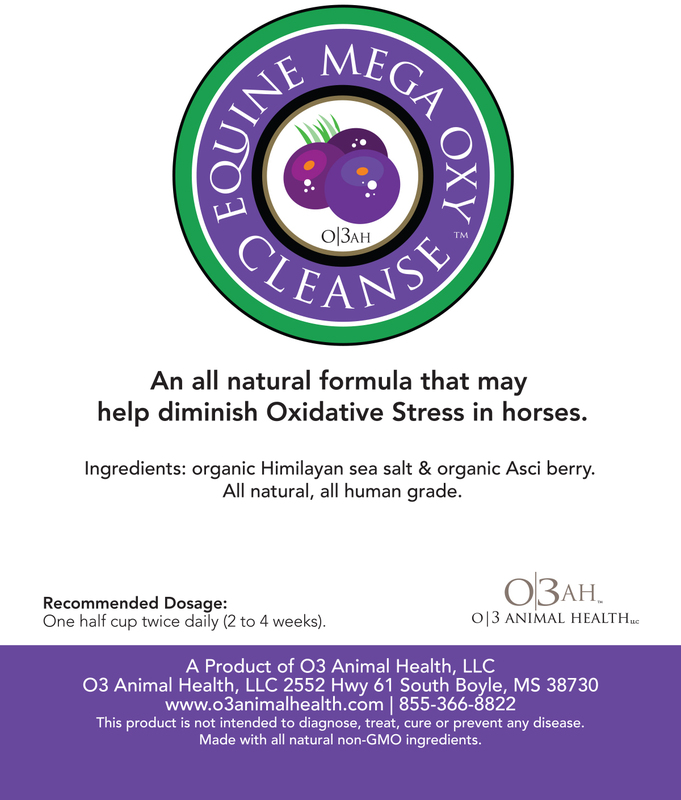 It has all of the benefits of Equine Omega Complete AND 10,000 IU's of all natural Vitamin E per daily dose. Equine Omega Vitamin E is a specifically formulated blend of mechanically expelled (not chemically extracted) organic soybean oil, human grade, deep water, wild caught fish oil and 10,000 IU's of all-natural vitamin E per daily dose. This product has NO chemical processing, NO hydrogenated fats, is comprised of all human grade ingredients with a very tight ratio of Omega 3's to Omega 6's. Equine Omega Vitamin E is formulated to support horses affected with conditions such as Equine Protozoal Myelitis, Equine Motor Neuron Disease (EMND), Vitamin E Deficient Myopathy (VEM), Nutritional Myodegeneration (NMD) or White Muscle Disease, Neuroaxonal Dystrophy (NAD) and Equine Degenerative Myeloencephalopathy (EDM). Our source of Vitamin E is D-Alpha Tocopherol. Recent studies have shown this form of Vitamin E was successful at maintaining needed blood levels of Vitamin E in the horse. Vitamin E is a fat-soluble vitamin. Equine Omega Vitamin E is an all-natural fat based supplement for ease of feeding, includes omega 3 fatty acids to support health at the cellular level, as well as a healthy source of calories. We suggest you consult with your Veterinarian before using Equine Omega Vitamin E for additional instructions. One gallon is a one month's supply for one horse. $107.95 per gallon.